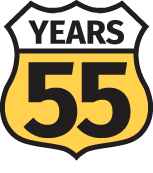 Since 1963 Zeisloft Trucking LLC has been one of the most prominent haulers of dry bulk commodities in the Mid-Atlantic Region. With that said, the third generation plans to capitalize off of this success to make it a prestigious national operation. Our fleet of flatbeds gives us the flexibility to haul a variety of products such as pallets, lumber, steel products, and etc. In addition, we are able to haul LTL to serve multiple clients on their specific needs. We utilize a variety of Boom-Trucks and flat-bed trailers equipped with either boom-cranes or fork-lifts enabling the convenient delivery of concrete and clay products such as paving stones, block, brick, and architectural & hardscape products. We use dry-bulk tank trailers to transport a variety of dry-bulk commodities such as sand, cement, fly-ash, and more. Tri-axle dumps and dump trailers make it easy for us to deliver aggregate sand, stone, dirt and other related materials to distributors and job sites. A message from Charles Zeisloft, Sr.
Charles D. “Chuck” Zeisloft happily lives out his dream every day! When Chuck was a boy growing up in Hazleton, PA his father worked for a coal company. Everyday Chuck loved to watch the trucks take away their loads of coal and he always dreamed of having his own fleet of trucks one day. 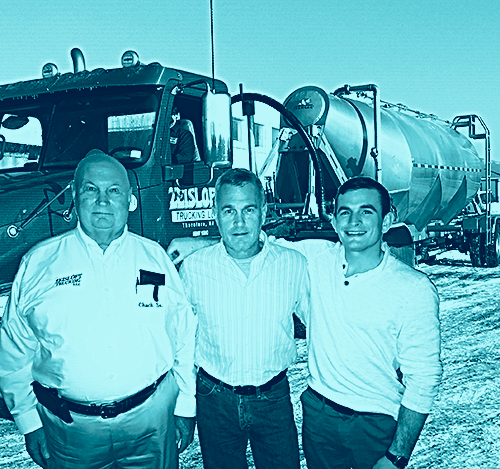 In 1963, Chuck Zeisloft bought his first truck, moved to Gloucester County, New Jersey, And began hauling blocks for the EP Henry Corp. By 1988, the company had grown to 11 trucks and about 70 percent of the business was still generated through EP Henry. During this time, another of Chuck’s dreams came true as his son, Chuck Jr., took an active interest in the business. Together they saw the need to establish a broader range of manufacturer relationships. The father and son team proceeded to expand their business adding the equipment necessary to satisfy a diversifying customer base. Zeisloft Trucking now provides services to other regional aggregate material and concrete product manufacturers. 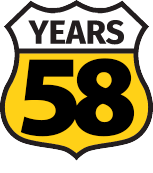 Today, the company supports a fleet of 27 power units, including 23 tractors, 3 boom-trucks and 4 tri-axle dumps. In addition, other equipment includes 12 bulk tank trailers, 4 flat trailers, and 8 dump-trailers. 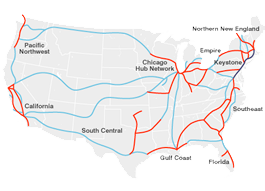 Capitalizing on past success we plan to make Zeisloft Trucking LLC a prestigious national operation. Whenever we call into Zeisloft Trucking they are willing to accommodate any load we ask for and you won’t find that anywhere else! Zeisloft Trucking is always on time, every time! 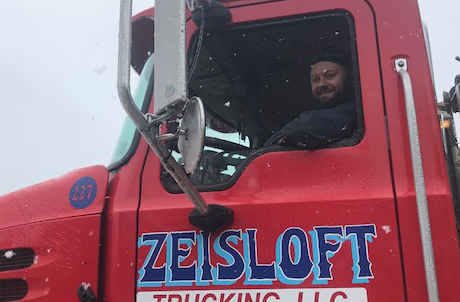 Zeisloft Trucking is very customer service oriented and will go the extra mile just to make their customer satisfied! Zeisloft Trucking LLC where “We Treat Our Employees Like Our Best Customers"